SEAN: J-Novel Club gives us a 4th Amagi Brilliant Park and a 6th Master of Ragnarok & Blesser of Einherjar. Kodansha, print-wise, has That Time I Got Reincarnated as a Slime 9 and… yeah, that’s it. Kodansha has a digital debut as well. Love Massage: Melting Beauty Treatment is one of those shoujo/josei hybrids that runs in Ane Friend. It seems to be about massage, though judging by the title and the cover, this is a bit more saucy than that other shoujo massage manga, The Magic Touch. MICHELLE: Huh. Provided it’s not too smutty, I might check this out. ANNA: Maybe…I’m usually intrigued by anything with a percentage of josei. SEAN: Also there is the 12th and final volume of Tsuredure Children, the 4th Peach Girl NEXT, and a 2nd World’s End and Apricot Jam. Seven Seas has a pile of stuff. Their debut is The Ideal Sponger Life, a manga based on an unlicensed light novel series about a man summoned to another world… to marry the princess and get her to bear a child! This apparently starts very “same as every other isekai” but quickly gets political, so may be a slow burner. It runs in Young Ace. MICHELLE: I thought that sounded kind of neat until I saw the gigantic bazooms on the cover. SEAN: In other Seven Seas news, Devils and Realist comes to an end with Vol. 15. There’s also The Bride and the Exorcist Knight 3, The Girl from the Other Side 6, Harukana Receive 3, Machimaho 2, Precarious Woman Executive Miss Black General 3, and Tomo-chan Is a Girl! 3. MICHELLE: I will always rejoice for more The Girl from the Other Side. ASH: Same. The series is a treasure. SEAN: SuBLime has a debut as well, with Candy Color Paradox. This BL series by long-running author Isaku Natsume runs in Shinshikan’s Dear+. Rival reporters in hot pursuit of a scoop. Will they find love? MICHELLE: It looks kinda cute! ASH: The creator’s previous series released in English, False Memories was rather charming, so I’ve hopes for this one, too. MELINDA: Count me in as cautiously optimistic. SEAN: Vertical has a 3rd omnibus of May-December romance After the Rain. MICHELLE: I really need to read this. SEAN: Viz’s debut is Fullmetal Alchemist: The Complete 4-panel Comics. This collects all the comedic 4-komas that were extras in the main manga, and has a few extras as well, I believe. For the FMA fan who loves to laugh. MELINDA: I am not always a fan of these 4-koma extras, but nobody does this better than Hiromu Arakawa, so I am 100% on board for this. Gimme, gimme. SEAN: They also have Radiant 4, Rin-Ne 29, and That Blue-Sky Feeling 2, which is the one that interests me the most. MICHELLE: I need to read That Blue-Sky Feeling, too. ASH: I really like the first volume! Definitely looking forward to reading more. ANNA: I need to check it out too! “Vertical has a 3rd omnibus of May-December romance After the Rain.” Ugh. I don’t think I’ve ever been in a relationship that didn’t fit this description. 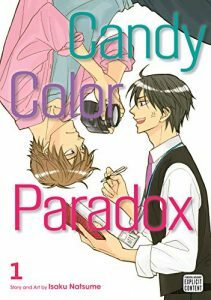 I’ll probably check out Candy Color Paradox eventually, but I’m currently buried under the weight of my 7 ounce Kindle thanks to Amazon bundle deals. Nine volumes of Tokyo Tarareba Girls for $63.50, twelve volumes of Horimiya for $80, eleven volumes of Sweetness & Lightning for $90, three omnibuses of Wotakoi for $18… How are these prices real? !